A comic behind the screens of the afterlife! 😉 And this comic would, of course, not be complete without a link to this scene of Bill and Ted’s Bogus Journey! 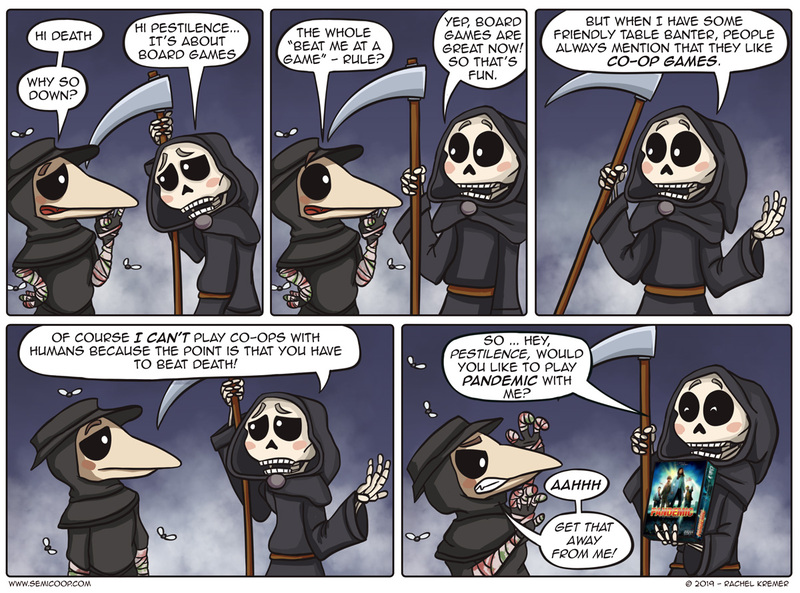 Poor Death just wants to try and play some co-op games. Last week, we finaly played Takenoko! We don’t own it, but luckily friends of ours have the game and brought it with them on a gamenight. It’s a delicious looking light and fun game, certainly one I would recommend to the “casual” gamers or for people that are looking for a game that’s and plays quickly. Also last week, we’ve listed an item for Board Game Geek’s Jack Vasel Memorial Fund Auction, an avatar and signed print of the highest bidder in Semi Co-op style! The generosity has blown our mind, since it already raised $600! Crazy and very awesome! What game would you play against Death? This cartoon gives off a lot of Discworld vibes, I love it! 1. The Campaign for North Africa. Prepare to have your mind blown by the fact that people have actually played this game. The map is 10 square feet. The game takes 10 players. The game includes 18,000 counters and a rulebook in three volumes. Each team consists of a Commander-in-Chief, a Logistics Commander, a Rear Area Commander, an Air Commander, and a Frontline Commander. And games have clocked in at 1500 hours, more than 2 months. It’s said that no one has actually ever finished the game. The only proper game choice, if you want the true Discworld Experience is Thud! If I could start the game then Connect four would be the one, since there is a way so the start player would always win ^^. In other words, after months of having “endless” semi co-op comics I’m finally caught up, had started from the beginning and I had a perpetual open tab with the one I was at so when I fancied it I could read one, don’t know what I’ll do now, it’s always so hard when you get up to day with a good series. Thanks for all the comics! They are awesome 😁. Haha, oh noes – it’s always terrible if that happens! Thanks for taking the time to read all of them! 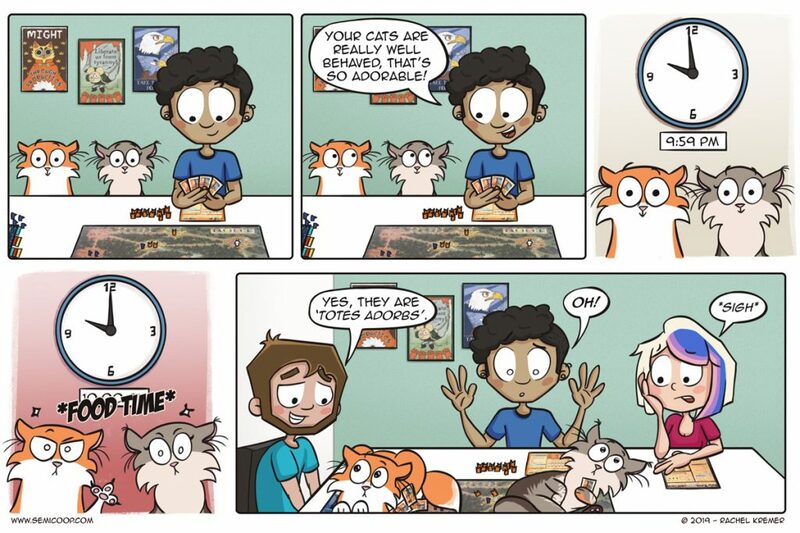 Have you also read the extra comics on our social media pages? If you did not, you’re in for a treat with more than 20 (smaller) comics! 😉 The easiest way to check those out would be our Instagram account, but if you’re patient: we’re planning to also publish them on our actual website in a few months.